Established in 1982 and listed in June 06, Kencana is mainly involved in providing engineering and fabrication services as well as marine engineering (eg building, refurbishing, repairing and converting marine vessels) and operations services businesses (eg offshore drilling, support vessel services, hook-up and commissioning activities). Recent pullback from 52-week high of RM2.96 (13 Jan) dragged prices to RM2.33 (26 Jan) but the bulls were quick to intercept to close at RM2.59 yesterday. The recent breakout from DTL and bounced above the mid Bollinger band and 50-d SMA suggest that a recovery is taking place at the moment and could see stronger rebound ahead. Price could swing towards the RM2.63 (50% FR) and RM2.71 (38.2% FR) in the short term. Thereafter, it should move closer towards RM2.81 (23.6% FR) and RM2.96 next. Technical indicators are showing signs of recovery. MACD histogram bars are falling at a slower pace while RSI has also hooked upward. Cut loss if prices fall below RM2.33. 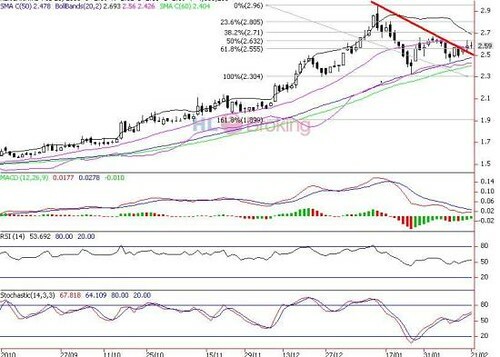 Kencana daily chart shows a positive breakout could spur prices higher toward RM2.71 - RM2.81 territory.